Rarely can a one-game player’s career have been as drama-packed as that of Laurie Gallagher. 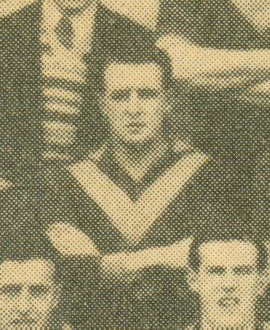 Gallagher, a burly, bustling half-bank flanker/utility player, had crossed to Collingwood from Fitzroy before the 1945 season. He had spent 1944 with the Maroons without cracking it for a senior game, having previously played with Abbotsford in the sub-district competition. He played the first four games of 1945 with the Magpie reserves, and did well enough to be named as an emergency on a couple of occasions. And in Round 5, that emergency happened. Another Collingwood rookie called Peter McLaren was selected to make his debut in the game against Essendon. But as the players were preparing to take the field, it was discovered that McLaren actually wasn’t eligible to play: he’d had trouble getting a clearance from Glen Alvie in Gippsland, and the paperwork still hadn’t come through. So Laurie Gallagher was called up at the last minute for what would prove to be his one and only senior game. (Coincidentally, McLaren would finally debut two weeks later once his clearance came through – but he, too, ended up playing only the one game). Gallagher’s debut passed without attracting much attention. He was sent back to the seconds the next week. And that seems to have killed Laurie Gallagher’s League career. No record exists of him playing anywhere else in 1945, and there is a belief that he might have been suspended for his permit irregularities (although AFL records have been unable to confirm what happened to him in the second half of 1945). There is also no record of where he played in 1946, but it is thought he returned to Abbotsford. What isknown beyond dispute, however, is that he returned to high level football at Northcote in 1947 – and quickly became a regular and highly regarded senior player there. He was one of Northcote’s most consistent players, mostly on a half-bank flank but also in the ruck and at half-forward. He was quick, strongly built (weighing around 82kg and standing around 178cm) and attacked the ball ferociously. Laurie was a splendid clubman at Northcote. A tailor by occupation, he was also a handy basketballer and frequently represented the VFA in their annual basketball game against the VFL. After his Northcote career ended in 1954 he coached in the country, first with Ardlethan near Wagga Wagga and later at Jerilderie in 58. Wherever he went, Laurie Gallagher was usually feted as the ‘ex-Northcote player’. Few seemed to recall his short-lived stint on footy’s highest stage with the Magpies back in 1945. That’s not surprising, given how brief it was, but it’s hard not to wonder whether he might have made a bigger mark had it not been for the permit issues that seemed to stop his VFL career just as it was starting.